Treasure Box Slot Machine Review - Casino Answers! Treasure Box is a 3-reel, 4-line multispin slot machine developed by Slotland Entertainment, featuring a wild symbol, treasury bonus and a progressive jackpot. You can play the Treasure Box classic slot machine at Slotland Casino. Bets on the Treasure Box slot machine are $0.50, $1 and $2 per line. You can select up to 4 paylines per spin. You can make different bets on each selected payline. The minimum bet that you can make on the Treasure Box slot game is $0.50 per spin. The maximum total bet is $8 per spin. 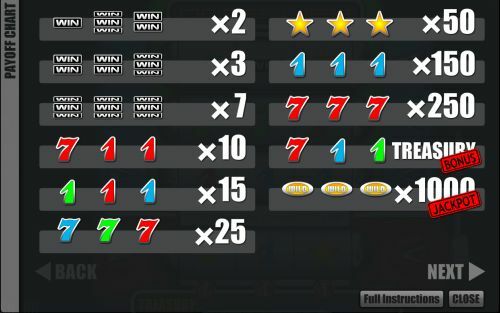 Treasure Box has a low betting range ideal for casual players or low rollers. To play the Treasure Box casino game, select your bets and pull the lever to spin the bottom reels. You can then select which (if any) of the symbols you wish to hold throughout the remaining reels on the above paylines for the second spin. Pull the lever a second time to make the second spin. The Treasure Box online slot is linked to Slotland’s progressive jackpot. At press time, this progressive jackpot was at a very nice $81,152. You can win it by hitting 3 Wild symbols on any selected payline when making the maximum bet of $2 on that line. If you aren’t making the maximum bet on that payline, you will instead win the 1000X top fixed payout. The Wild symbol will substitute for all other symbols in Treasure Box Slots. To play for the Slotland Progressive Jackpot, play the Treasure Box slot game at Slotland Casino. Whenever a Wild symbol lands on a payline, the bet you placed on that payline will be added to the treasury bonus fund. 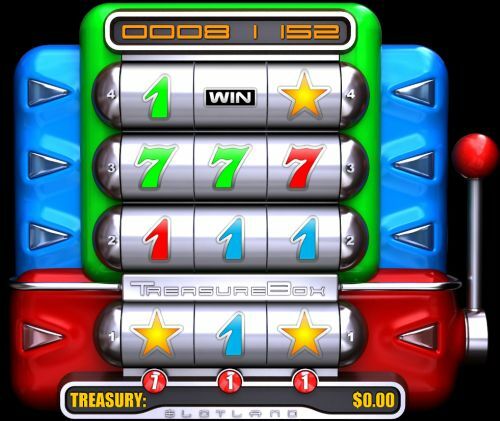 To win the Treasure Box treasury bonus, you must land a winning combination of 7-1-1 (in any colour) on all of the paylines. The current treasury amount is listed below the bottom reels. Treasure Box is almost like playing a hand of poker. If you’re given a valuable symbol, you have the chance to hold onto that symbol and play it on the second spin. It’s a concept that is not foreign to slot machines, but we’re surprised not as many developers put slot machines out like this. Not everyone wants to play skins of the same old slots over and over again. You can play the Treasure Box classic slot when you sign up and make a deposit at Slotland Casino. Can players from the United States play the Treasure Box slot machine for real money? Players from the USA are welcome to play all of the very exciting online slot games over at Slotland Casino! Is there a flash game of the Treasure Box slot that I can play? The Treasure Box slot game is only played in your web browser. You can play for real money only. If you have any issues with the slot’s performance, make sure you have the newest version of Adobe Flash Player installed on your computer. Can I play the Treasure Box online slot for free? Unfortunately, free play is not available on the Treasure Box fruit machine. For lots of similar slots that you can play for free, please visit Win A Day Casino. Is there an autoplay mode on the Treasure Box online casino slot? No, the Treasure Box multi-spin slot machine does not have an autospin mode available. How do I win the Treasure Box Progressive Jackpot? Make sure you are playing the $2 per line maximum bet on the Treasure Box symbol. Watch out for the Wild symbol on the bottom reel, as you will want to hold it for the re-spin! Now, if you can land 3 Wild symbols on one of those paylines, you will win the Slotland Progressive Jackpot!